Hello. This is a picture of my latest ray gun. It's a work in progress, it's machined from 70/76/T6 aluminum, and some brass for contrast. This will be a fully functional device, With sound effects recorded by me (From the laser in "Goldfinger" the James Bond movie.) It has a digital readout that monitors the lithium-ion battery that powers it, and a 6 Watt laser diode. I should have it finished and ready for testing by October. I'll post more photos then. Yes, very cool and second what Cyp is asking. The horizontal slot in the nose in front of the trigger finger. Ed. What kind if battery will you use? Nice work Ed, I like your attention to details; can't wait to see the finished product! Hello. I'm going to use a 7.4V 250mAh 20C 5A Li-ion Battery. It worked very well in the preliminary tests. 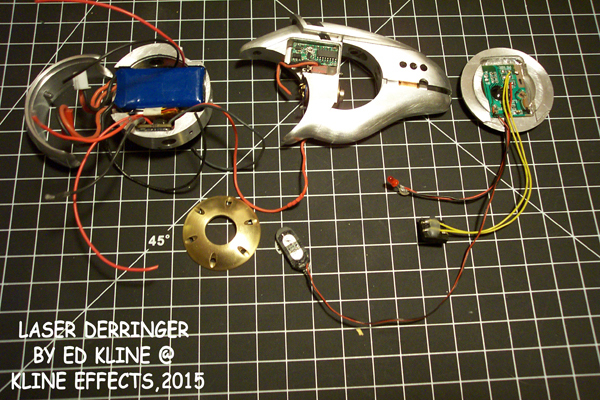 Besides, its the biggest battery I could stuff into the rear of the derringer. Ed. Oh yes. This looks awesome. Like something that should be in The Fifth Element. Lol. Can't wait to see beam shots. I like that switch, is that a door bell button? Hello. Thank you for the comment. The switch can be found on EBAY at: 12mm 3V/2A Blue LED angel eye metal push button momentary switch High Head. I hope that helps. Ed. I like it...A lot !!! Steampunk....yet....sleek....and small !!!!! I've seen that movie 10 times or more but I will still watch it, you can always catch a little something extra that fits, it was a fun movie. I know you watch Rick and Morty don't you, it's like stuff I have day dreamed, very creative and thought provoking. 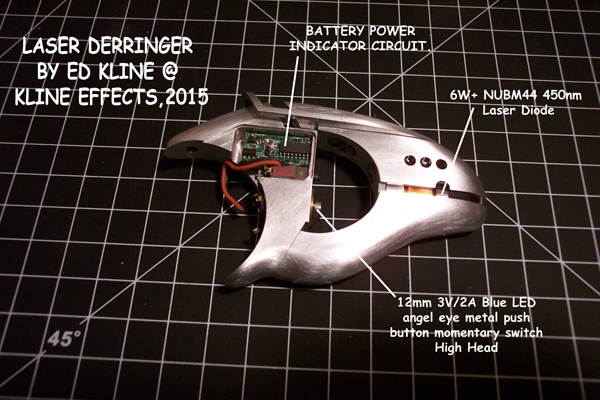 I thought I would share my work in progress of my laser derringer. I'm just showing the main components, most of the wiring has to be threaded through the assemblies and trimmed, soldered, heatshrinked, etc. Then a run of tests. Ed.